Selecting the perfect set of Scotch Glasses is important for a true Scotch connoisseur. Scotch is considered the most complex of spirits and the perfect glass will help you enjoy it that much more. Scotch Glasses come in several styles and it is important to select the correct one. If you prefer your Scotch neat you will want to look at the Glencairn Glasses or the Riedel Vinum Single Malt Scotch Glasses. On the other hand if you enjoy your Scotch on the rocks you should take a look at the Waterford Bar Ware. I hope to help you enjoy this guide. Feel free to comment below and share it with your friends. As a little history, Scotch whiskey is a type of whiskey particular to Scotland (hence the name) available in 5 categories: single malt, single grain, blended malt, blended grain, and blended. Among these differing styles, each whiskey has several traits in common, being that they are all aged at a minimum of three years in oak barrels, contain a minimum of 40% alcohol, and most of all, are produced within the Scottish boundaries. As far as glassware is concerned, Scotch aficionados gravitate towards two major Scotch glasses. The first — and potentially most popular, but that is arguable — is the tulip-shaped scotch glass, more officially recognized as the Glencairn glass. While several subtypes of Scotch glasses are available, they are all exemplified by this outstanding piece of artistic glassware. 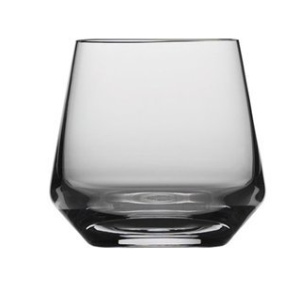 The wide base of the scotch glass is designed to contour along the human hand. It has elegant curves that allow the outside world to view the rich colors. It is designed so that the hand holding the scotch glass mildly stimulates a minor evaporation, sending a small plume of aroma dancing through the curves of the top. This creates a bottling effect, sending these dark, woody scents into the nearby atmosphere. The high walls of this glass also allow for some swirling of the Scotch in order to better view the color and sample the fragrance of the beverage. On the other hand, the tumbler is a much more common and versatile Scotch glass than it’s slightly more sophisticated compatriot. With a flat (as opposed to curved, a la Glencairn) base and rounded mouth (as opposed to tulip-shaped and tapered), this holder is much more common for cocktails. Another version of the tumbler is the ‘Old-Fashioned glass’ specifically designed for — you guessed it — Old Fashioneds and straight liquor ‘on the rocks’. A happy medium does exist, however, for the straight-laced aficionado and the average Scotch consumer wanting to become more educated on the subject. 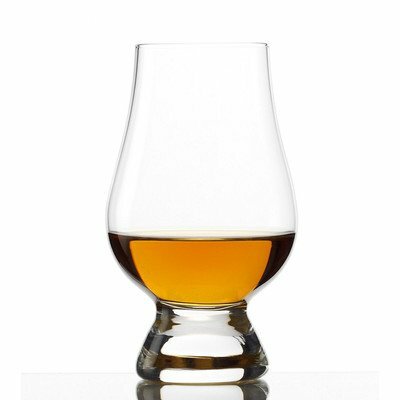 There is a style of Scotch glass that combines the curved base and the tapered mouth of the Glencairn style, with the heavy base and wider mouth of the Old-Fashioned glass. The artistry behind these Scotch glasses merely combines the attributes of the Glencairn, yet the formation prevents the mouth of the glass from allowing ice cubes. If one were to arrange them in increasing order of perceived sophistication, the list would be as follows: tumbler (more widely used for ‘on the rocks’ beverages, cocktails, and others), slightly tapered Glencairn/tumbler hybrid (think of it as the shape of a tulip not fully bloomed yet, with an almost bursting bulb), and the Glencairn. The two former scotch glasses are more versatile, as a percentage of Scotch drinkers prefer a few drops of water with their beverage to release the full, woody flavor of the barley inside. The open mouth, allowing the ice cubes for the ‘on the rocks’ pour, is perfect for this. As the cubes themselves melt, they provide the water preferred by the drinker. The general consensus, however, is that the ice cubes cool the whiskey, masking some of the heavier flavors from the taster. A system from heaven for the beginner, yes? Simultaneously, the thicker base and edges on the shorter, stockier tumbler scotch glasses allow for (theoretically) rougher play. This means that they can be tolerated by the standard, rowdy bar crew without worrying over breaking a stem or lip, as in the case of the Glencairn Scotch glass. The craftsmanship behind this glassware is on par with the fine tuning of a sports car. Within these Scotch glasses lie both a science and an art form, peacefully coexisting together. These scotch glasses exist for a reason. The man who drinks Scotch does not simply drink it because it’s the nearest beverage. He drinks it because of the history within the bottle, the combined artisanship of the distiller, the craftsmanship of the barrel, the glass so finely molded to the human form. He consumes this because of the natural flavor that reminds him of better times, gives hope for better times ahead, and because this beverage acts as the perfect mood enhancer. Essentially, what it provides is quality. There is no shortcomings in Scotch whiskey; there are only preferences and choices — minor flourishes and nuances that waft from Scottish distillery to Scottish distillery as elegant as the aromas escaping the glasses in which they eventually reside. There are no problems with Scotch whiskey — merely adventures to be had. Drinking single malt scotch is pure enjoyment and a set of single malt scotch glasses help complete the experience. Congratulations if you are just now discovering Scotch. This is one of those pleasures best suited to those who know how to enjoy it. Single malt scotch presents itself to the senses. Knowing what type of glass to use is just as important as the quality of the scotch itself. In order to call it Scotch whisky, a company must first distill it in Scotland. Distillers use only malt barley and spell “whisky” without the “e.” A third requirement is aging; three years is the minimum. Oak barrels add to its smoky flavor. Single Malt Scotch Glasses are not required but should be. The majority of scotch is blended. The sole purpose of this is to make it easier to drink. The connoisseur, however, prefers the bold, acquired taste of single malt scotch. Single Malt Scotch Glasses are made to complete the drinking experience. The classic tulip shape is the most common. The design permits full enjoyment of all three taste sensations. The first phase is smell. The wide lower portion of the glass allows for swirling the drink to bring out its aroma. The narrow top concentrates that delicious smell. A final widening at the rim finishes the effect. The second taste is when the scotch comes into contact with the taste buds. After swallowing, the aftertaste arrives. The tulip form dominates a variety of styles. The shape sits atop a long, delicate stem. The stem serves no purpose other than aesthetics. Some are short and thick; others are long and fragile. When picking out the perfect set of single malt scotch glasses you will have your options. Single malt scotch connoisseurs love the drink for its strong “peaty” flavor. The sparkling clarity of crystal glasses adds to the experience. Crystal contains lead oxide. The lead seeps out of the material upon coming into contact with alcohol. The small amount of lead safely combines with thescotch, complementing the flavor. The nosing glass is an important tool for distillers and master blenders. The design sends the smell to the top of the glass. Historically, it was called a “dock glass.” Merchants used it to “nose” the product before finalizing the sale. Its shape is similar to a tulip without the flare at the top. Tumblers consist of a thick glass and may be round or square-shaped. The tumbler is primarily used for drinking scotch on-the-rocks. While this may not be ideal for the connoisseur, it is a popular way to enjoy the sophisticated spirit. Because of the strong flavor of single malt scotch, some consume it mixed with a carbonated water. The tumbler is perfect for this. Single malt scotch has a long history of pleasing discriminating palates all over the world. Give it a try and find out what the fuss is all about. Start by tasting it from a classic tulip-shaped glass. If you find it is too strong to enjoy, consider serving it in a tumbler on-the-rocks. You can alternate until you acquire the taste. Consuming too much is dangerous. Moderate use is enjoyable. Cheers! Scotch is a certain type of whiskey that is distilled in Scotland. There are different types of Scotch including Single Malt, Single Grain, Blended Malt, Blended Grain, and Blended. While many women enjoy Scotch, it is seen as being a real man’s drink. Drinking Scotch is seen by many as a sign of manliness. Scotch is not one of those alcoholic beverages that is good for getting drunk. It is too expensive and takes some time acquiring a taste for it. For those that do enjoy Scotch, the glass that holds the Scotch is an important part of the experience. And yes, there are different types of Scotch glasses. Selecting the right one depends on personal preference and how one enjoys his or her Scotch. There are primarily two types of Scotch glasses, the tumbler and the tulip-shaped glass. Sure, there may be a few odd outliers that consider themselves Scotch glasses, and they may even make a good argument for their claim, but there are two types that are widely enjoyed by Scotch enthusiasts. Many Scotch drinkers desire the personalized effect of engraved Scotch glasses. The first type of Scotch glass is the tumbler. The tumbler has a wide top. This type of Scotch glass is good to use if the Scotch is being served with ice or a mixer. If Scotch is ordered at a bar or restaurant, the tumbler is usually the type of glass in which the Scotch is served. Often, the bar or restaurant will proudly display their logo on the sides of the engraved Scotch glasses. The second type of Scotch glass is the tulip-shaped glass. The tulip-shaped glass is not meant to be served with ice or a mixer. 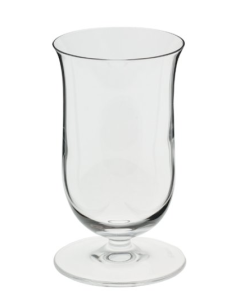 The tulip-shaped glass has a wide area at the bottom where the Scotch sits and has a narrow top. The wide area at the bottom allows for evaporation from the warmth of the hand. It is also easier to hold than the tumbler. The narrow opening at the top of this glass serves to concentrate the aroma of the Scotch toward the nose. This allows for a stronger experience and is enjoyed by those that really like the taste of Scotch. Being that the tulip-shaped glass is also considered more elegant, many will choose to have their initials etched into their engraved Scotch glasses. Or, some even choose to have an icon that represents their favorite hobby or their career decorating their engraved Scotch glasses. The type of glass used is important to many that enjoy Scotch. Drinking Scotch from engraved Scotch glasses adds charm to the moment, while allowing them the pleasure of showing off their taste of the finer things in life. Scotch drinkers are a class of individuals that can appreciate the nuances of different types of Scotch or just sit back and relax with a pleasant glass served neat in your favorite set of crystal scotch glasses. For different types of experiences though, a Scotch drinking enthusiast should really consider the type of glass that’s used to consume this spirit. Crystal scotch glasses come in different shapes and sizes that actually have the ability to bring out unique tastes and smells from the Scotch that’s poured into them. Two major glass styles serve distinct purposes and should be considered before taking a sip; one style has straight walls and the other contains a tapered curve. 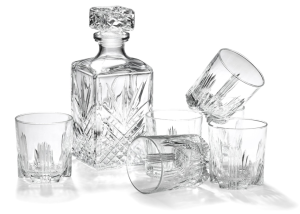 Old Fashioned Crystal Scotch Glasses the classic square whiskey tumbler was originally designed for combining whiskey and soda. A glass such as this can definitely be used to enjoy drinking scotch long or neat. These crystal scotch glasses are the perfect size to hold a standard 2.5 ounce cocktail. The weight in the hand is often very pleasant as most manufacturers add more girth to the bottom of the glass. This comes in handy for Scotch drinking connoisseurs who have possibly overestimated the strength of their treat and have become a little too relaxed. The rim of these crystal scotch glasses is reinforced by maintaining quality standards that ensure a perfectly round cut. Scotch whiskey sippers that appreciate a classic look will love owning a set. These crystal scotch glasses are characterized by their straight walls and weigh between nine and 12 ounces. Round or square, they serve their purpose and offer a convenient way to hold other liquors as well. A Glass Used for Aroma and NosingDifferent types of Scotch have subtle nuances that can be distinguished by both smelling and tasting the spirit. In these cases, when a Scotchdrinker wants to appreciate and pick out all of the flavors, bouquet and aroma that a quality Scotch has to offer, crystal scotch glasses with tapering should be used. These classy looking glasses have become the standard whiskey glass used by distilleries to showcase and present their product. The bottom portion of these crystal scotch glasses is warmed by the hand which begins a process of evaporation. The glass tapers and gets narrower at the top which traps in aroma and lets it linger on the nose. A relaxing moment with a single malt scotch is usually achieved by using these type of crystal scotch glasses. While they may look more delicate than an old-fashioned glass that has straight walls, tapered glasses have been perfected by many years of engineering to withstand easy knocks or drops from a respectable height. Scotch is a spirit that will be enjoyed for many more years. Enhancing its qualities or simply relaxing with it can be enhanced by using crystal scotch glasses with separate qualities, craftsmanship and purpose.